Recycle Your Holiday Cards for Fun, Beautiful Gift Tags!! Save your holiday greeting cards this year to create beautiful gift tags for next year! I kept a stash last year with this idea in mind and it's cool to finally make it happen! 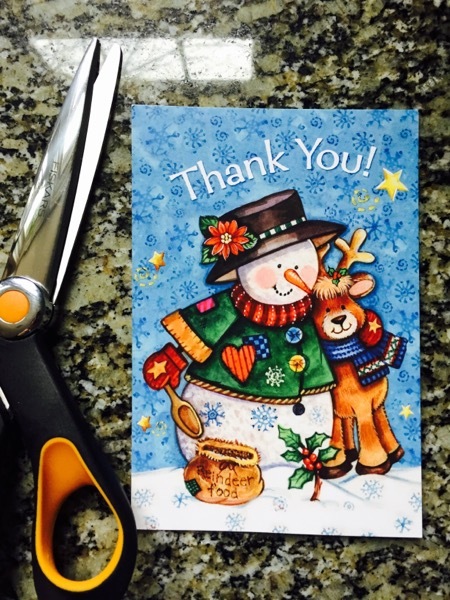 Simply pick a greeting card you like and cut it up the seem. Flip over the decorative side of the card and write your message to a loved one as shown in the photo below. Punch a hole in the top left corner and string it with ribbon or twine. Attach it to your gift and voila! You can also collect cards for birthdays, anniversaries or any other milestone.